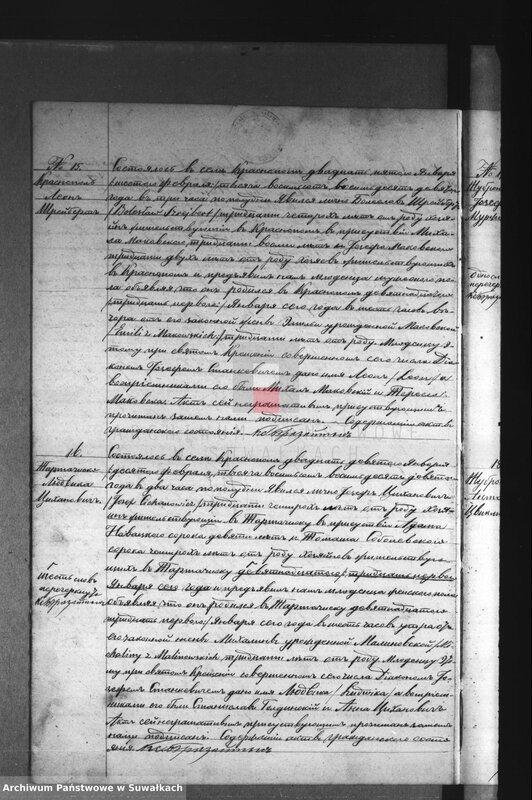 Looking for family that came from krasnopol with the surname Szrejbert or other possible spellings. My grandfather came to the us about 1905. His name was Leo szrejbert and May have had a brother Joseph. Not sure if you have this information yet or not. 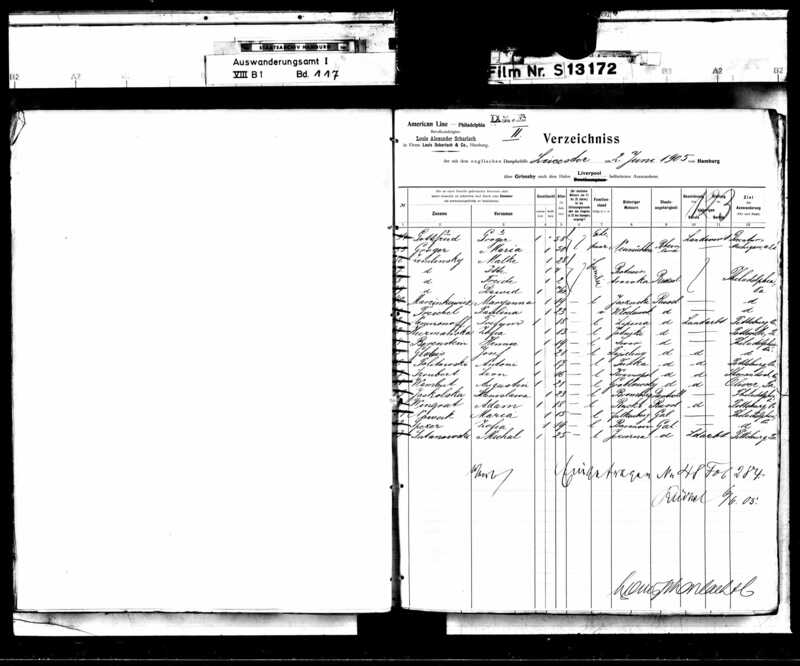 In Ancestry.com searches, I found the Hamburg passenger list and the Philadelphia passenger list for Leon Szrejbert, age 16, from Krasnopol, Poland traveling to his brother, Jozef, living in Shenandoah, PA. That would make his birth year about 1889. See attached. I then found the parish records online for Krasnopol and looked in the 1889 book. I think I found his birth record which is attached. It is written in Russian, so you can post it in the Russian translation forum and request translation. Looks like his parents are: Boleslaw Szrejbert and Emili Manowski. thanks for the reply and all the info you sent. i know very little of my family so i joined ancestry.com and found some things and also through 23 and me dna results. i'm not sure if the dates of 1889 are correct, on leo draft registration it shows a birthday of june 15th 1890. I am seeing several variations of the spelling of the last name one of which is Szrajbert which I found a name for in Krasnopol for the mayor who has a facebook page but I do not. my grandfathers spelling was changed from szrejbert to Snybert when he came to the U.S. that is the name which he was married under in 1913 in new jersey. the family story was that at some point he left the family in N.J. and went back to Poland but I don't no when, possibly in the 50's. I'm confused about the shipping manifests that seem to show one ship leaving from Hamburg and one from Liverpool. i am going to try to get that document you sent translated somehow to see if I can clear up some details. Thanks again for your efforts. write back if you find out more. One way to find out for sure is to get his marriage application from the State of NJ. Ancestry.com shows Leon Szrejbert marrying Marianna Krzesicka in NJ in 1913. It is just an index, but it has the file number (35724) so you can request the full application from Trenton, NJ archives. I am attaching the index record. 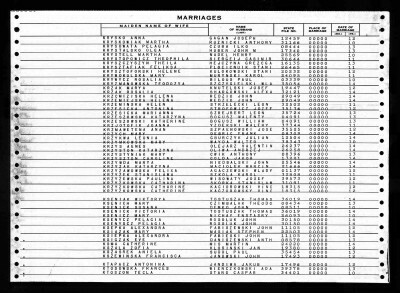 Marriage applications almost always have the names of the groom and bride's parents. If parents in Leon's marriage application match those in the birth record I gave you, then we found your Leon. 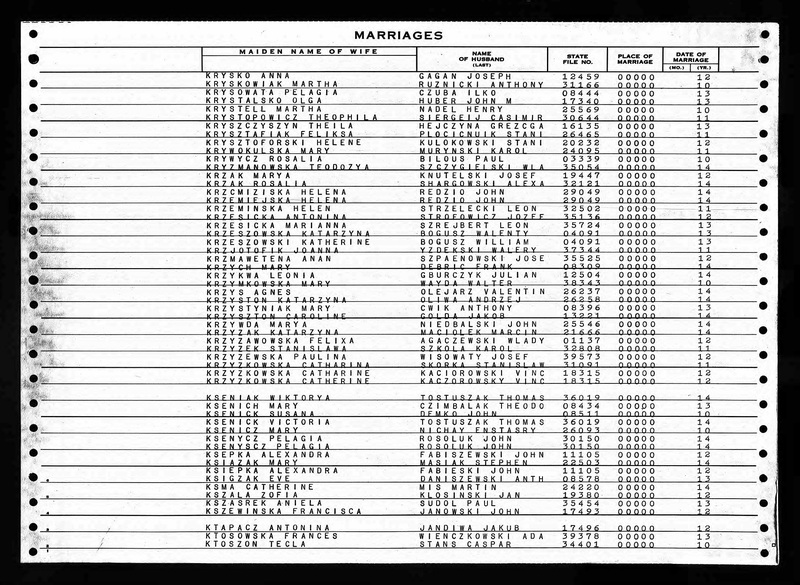 Note: In addition to these details in the searchable index, a state file number, a code for the marriage location, and the month of marriage can be viewed on the image, when available. The actual marriage record will typically contain even more details, so it’s important to obtain a copy of the record itself. 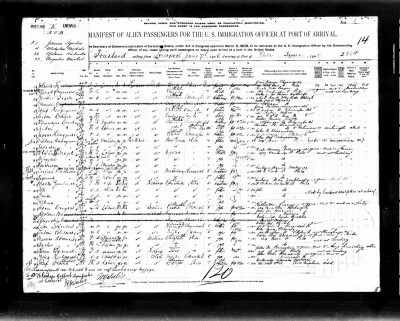 The New Jersey State Archives maintains all birth, marriage, and death records filed at the state level starting in May 1848 and ending 100 years ago. Requests for certificates of these records should be submitted by mail, along with a fee, using the New Jersey State Archives' downloadable request form:"
Also, Polish names often changed with various spellings once the person immigrated to the USA. The reason is that very often the person writing the record would spell it the way it sounded to him/her. It is very common to find records with a variety of spellings for the Polish surname in the USA. That is why you need to look at other evidence. 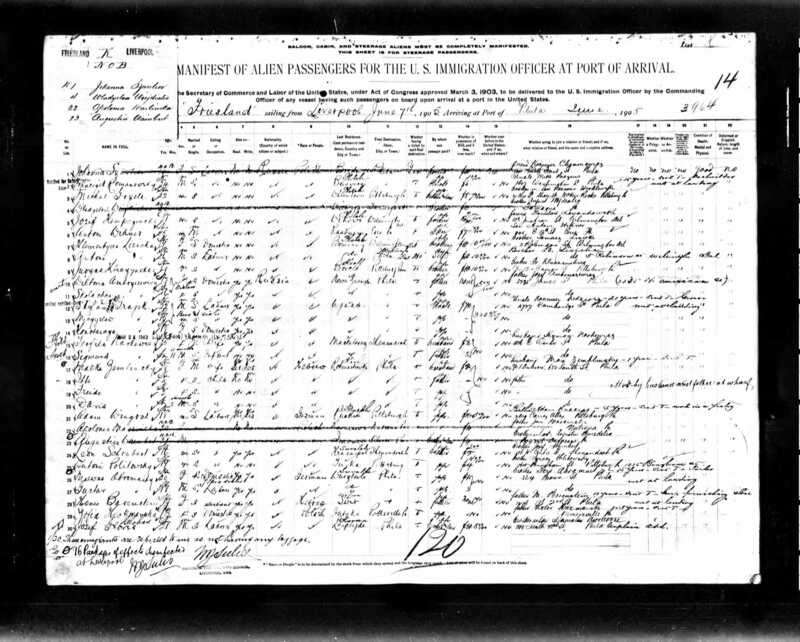 The passenger lists and the marriage index fit everything you said regarding your Leon: from Krasnopol, traveling to brother Jozef; arriving in 1905; married in NJ 1913. As to military records and different birth dates: Be cautious of there being more than one person with the same or similar name in the same area... you could be dealing with two different people with the name Leon Szrejbert. Getting the full marriage record from NJ would be a good next step. You are very welcome! I received so much help from members of this community, that I am happy to "pay it forward" when I can. Also, I checked the WWI and WWII military records in Ancestry.com. It seems to be your Leon, and I would not be too put off by the different birth dates in these military records. It was common for our ancestors to forget their exact birth dates and give their best estimate to the people requesting the information. My grandparents did this and it drove me crazy when I was researching them! When I got their marriage application with parents names, then I was able to find their birth records in Poland that had the exact birth date (which of course was different than any of their US records!). BTW, Did you know there is a Social Security death index in Ancestry.com for Leon Snybert who died in Dec 1972 in Poland? Apparently, he was collecting social security through the US consulate in Poland until he died in 1972. This could be your Leon... it matches with your family story that he returned to Poland. 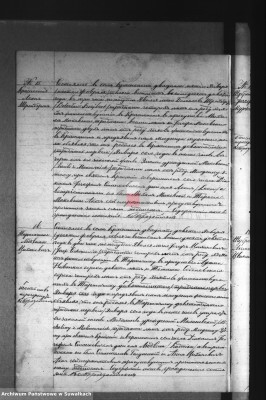 To get this translated, you have to repost the image to the “Russian Records Translation Forum” with a request for translation. Otherwise no one will see it buried in this thread. Also, when you request the translation, ask them to translate record #15 on the page. You can donate to the general fund of Polish Origins and/or you can donate to The person who will do the translation for you.